Straight after I finished the course I wasted no time and started the ball rolling with advertising heavily and using Darren’s guidance on advertising it didn’t take long for the phone to start ringing. My first job laying a slate floor, feeling a little nervous i contacted Darren for some reassurance who immediately responded even though it was a weekend evening with some more sound advice. The job went fine and I had nothing to worry about, everything that was taught on the course just fell into place. Within a week I left my dead end job and concentrated on my own tiling business and I have been working 7 days a week to keep up with demand of the amount of business that I am winning due to the training and business sales advice given by Darren. I am averaging 90% success rate on winning my jobs. In the last six months I have been trading I have also been in a financial position to be able to give something back to the community by being able to sponsor a girls under 12 football team. 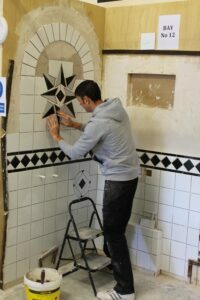 Since starting my tiling business it has been the best thing that I have done and my only regret was I wish I did it sooner and found this course. 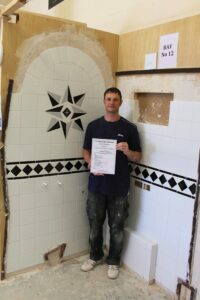 If you are hesitant in any way I would suggest speaking with Darren or Tracey and enroll on one of their professional tiling courses, you will not regret it one bit and the after course support is fantastic. Many thanks to Darren and Tracey for helping me achieve my goal.